Having a form of communication during a disaster can determine life or death. There are stories of people who were in New Orleans during Hurricane Katrina that were saved from the floods because they were able to communicate with a HAM license operator. It’s not easy to jump directly into the amateur radio world especially with all the radios and tools that come along with. This post will be a Baoefeng UV-5R review. It’s commonly known as their starter HAM radio. The Baofeng UV-5R can be purchased at many electronics stores online and even locally. However, you do have to be careful not to purchase a knock off. They are all manufactured in China but distributed primarily in Houston, Texas for American purchases. So if you are buying online pay attention to where the distributor is located. I feel safer purchasing the radio HERE on Amazon directly from the distributor than from many other stores that you can find online. The price will run you anywhere between $25 to $35. It took about a week to receive the radio. It weighs 1.06 pounds and is 6 incches x 8 inches x 4 inches. It also comes along with a one year warranty. The Baofeng UV-5R has maximum output of 8 watts and a speaker output of 700mw. The frequency range is pretty standard for a mobile HAM radio with VHF (136-174) and UHF (400-520) It also has a built in FM radio in case you need to listen to radio stations for the latest urgent news. Finally it includes the auto band detection. It also comes with a headphone and microphone connector. That way you can be discreet with your conversations. You can also attach the Baofeng UV-5R to your belt with the belt clip that is included. Now you can upgrade the antenna and it is also compatible with extended batteries. Finally it does include an LED flashlight in case you don’t have one near and needed to find something close. It is small and doesn’t shine very bright. As a noob to the amateur radio world I really had fun exploring the radio stations by scanning. It is interesting to find out what you can pick up. There is also some strange things that you may hear like someone telling odd stories. The only issue that I had was truly because of my own lack of knowledge. However, it doesn’t help that the manufacturer doesn’t provide a detail manual to explain the functions of the radio. You can find a great manual HERE. 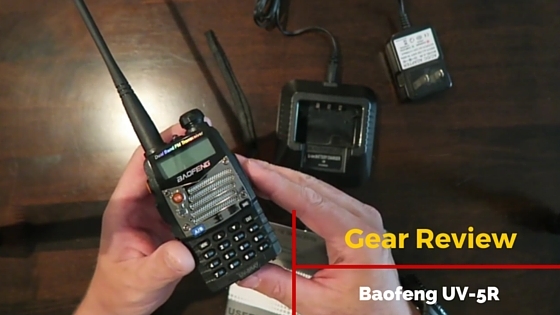 Also, I have done video explaining How to Use the Baofeng UV-5R. There will be a follow up video explaining how to program channels. After reading the manual that I found online I was able to quickly understand how to use the Baofeng UV-5R. I was able to program my local emergency channels including the utility company. That way in case there is ever a flood or power is down I can stay up to date with the progress. Altogether I believe that the Baofeng UV-5R is really for the HAM radio operator trying to get a better understanding and maybe even studying for the license. It’s simple to use and gives you the basic abilities to communicate during an emergency. If you are beginning to study for your HAM radio license then I would definitely recommend buying this radio and have fun with it. BE SURE NOT TO PRESS TO TALK IF YOU DON’T HAVE YOUR LICENSE! But you can definitely listen in! Leave a comment below if you have any questions about the Baofeng UV-5R. I can definitely share all that I am learning. If you have any suggestions then feel free to leave a comment below. Your feedback helps the prepper community.